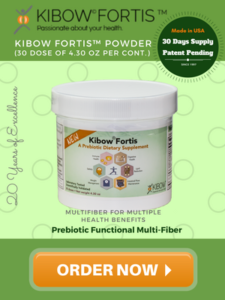 Kibow Fortis™ has been formulated using soluble and insoluble fibers which are GRAS certified, well-studied and documented for their health benefits. 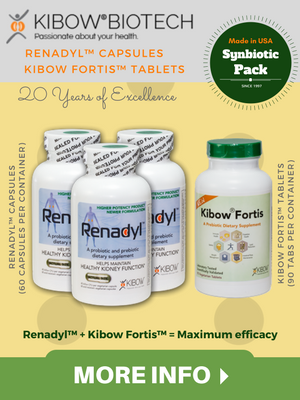 All of these selected functional fibers have the additional ability to function as a prebiotic by stimulating the growth of the beneficial bacteria namely; the lactobacilli and the bifidobacteria which was confirmed by in-vitro lab studies [Kibow Fortis – Lab Studies 1]. 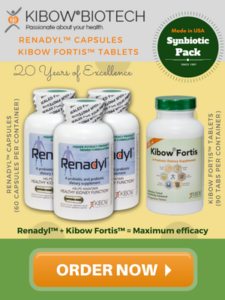 Click here to download a Kibow Fortis™ (Tablets) Product Information Sheet (PDF). 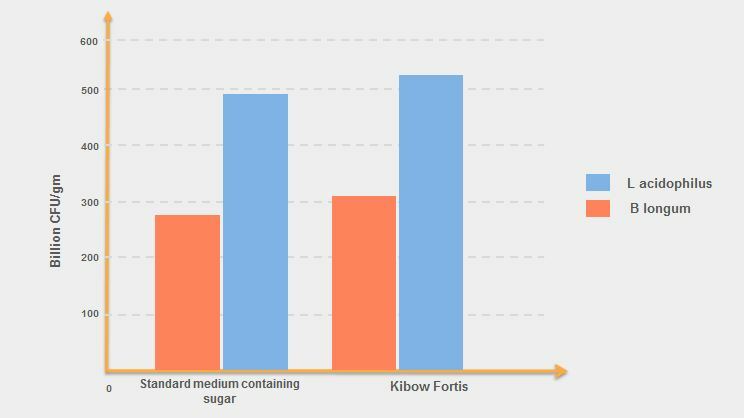 Click here to download a Kibow Fortis™ (Powder) Product Information Sheet (PDF). An imbalance of gut microflora (condition known as “dysbiosis”) is characterized by a higher population of pathogens that produce inflammatory and toxic compounds. Increased levels of pro inflammatory cytokines IL-6, IL-18, IL-1β and TNF-α leads to the development of low grade systemic inflammation. Increasing the population of the native beneficial gut microbiota including probiotics belonging to Bifidobacteria and Lactobacteria can restore the balance in gut microflora and thus lower the inflammation. 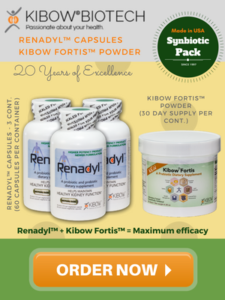 The Kibow Fortis™ blend has high lactogenic and bifidogenic property that can restore a well- balanced gut microflora and lower the production of toxic metabolites and inflammation. In addition to the prebiotic property, each ingredient carries its own health benefit, listed in the table above. 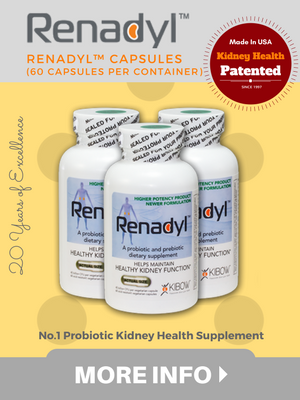 The well-known prebiotics XOS and Arabinogalactan have immunomodulatory effects, with potential in lipid management. Inulin, fermented by probiotic bacteria in the colon to the short-chain fatty acid butyrate, can reduce the risk of colon cancer. It is also known to reduce the risk of atherosclerosis by decreasing the plasma levels of triacyl glycerol and inhibiting the hepatic lipogenesis. The reduction of blood lipid and glucose levels by inulin has been observed in the studies of diabetic rats. The β (1-3/1-6) glucans in the fiber blend derived from medicinal mushrooms and yeast have been well studied for their anti carcinogenic property and ability to enhance immunity through suppression of IL-8 secretion. 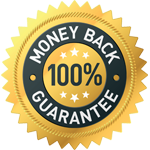 The oat β glucan having the 1-3/1-4 linkage, has been well studied for its anti cholesterolemic effect, weight management and imparting satiety. 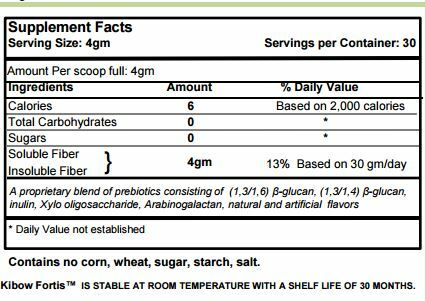 To sum up, this blend of soluble and insoluble fibers is an excellent multi fiber complex with many potential benefits. This multifiber formulation may help to: (1) lower inflammatory biomarkers,(2) reduce colon cancer risk,(3) regulate blood glucose,(4) reduce blood lipids (5) help in weight management and (6)restore gut microbiota balance. 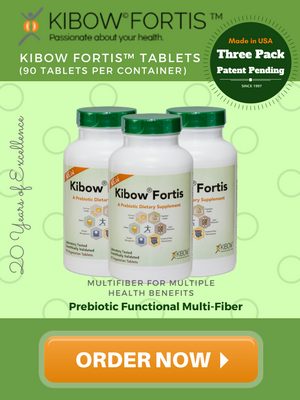 Kibow Fortis™ is a prebiotic multi-fiber dietary supplement for overall wellness applications including weight management, satiety, digestive health, lipid reduction, and intestinal flora maintenance through daily dietary fiber augmentation. 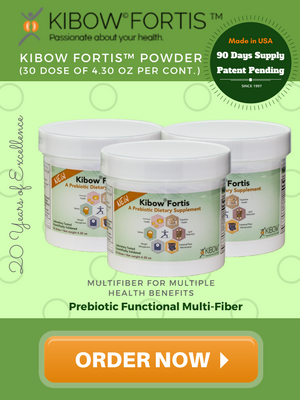 Unlike other dietary fiber supplements, Kibow Fortis™ consists of both soluble and insoluble fibers providing unique general wellness benefits. 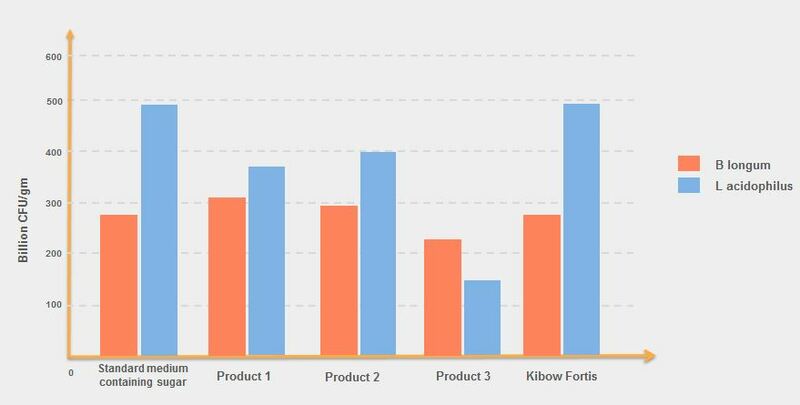 As seen from figure 2 Kibow Fortis™ has the highest bifidogenic activity compared to all the three competitor products which are sold by large well known pharma companies. 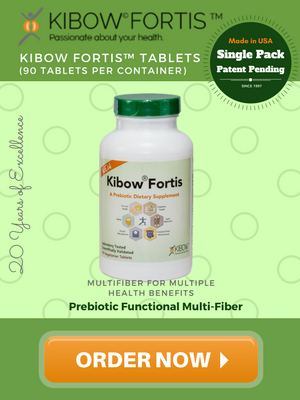 Kibow Fortis™ is sold in two forms tablets and powder with orange flavor. The tablet formulation has 90 vegetarian tablets, 1-2 tablets to be taken 3 times a day. 3 tablets contain 4 grams of dietary fiber. Would you like to Order Kibow Fortis™?